With its beautiful hues of purple the February birthstone amethyst was a favored gemstone of ancient royalty, and remains one of the most popular gemstones of today. A member of the quartz family, amethyst gemstones range in color from the palest lilac to the deepest purple. Amethysts with intense, vibrant, rich purple colors have long been considered the most precious of these natural crystals and the preferred color choice of jewelry buyers for decades. 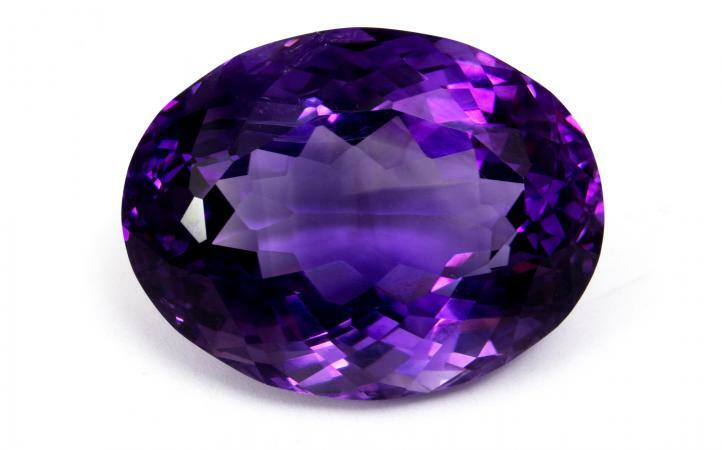 The popularity, however, of very light lavender amethyst gemstones, known as the Rose of France is growing rapidly. Although classified as a semi-precious gemstone today, from the time of the ancient Mesopotamian civilization through the Middle Ages amethysts held the classification of precious gems. Worn by Egyptian Pharaohs, reigning kings and queens and Cardinals of the church, these stunning gemstones shared the title of one of the five Cardinal Gems along with diamonds, rubies, emeralds and sapphires. Derived from the Greek word amethysotos which means sober, the people of medieval times believed in the protective powers of amethyst. They believed it protected them from the effects of drunkenness, stopped them from being poisoned and helped hunters with capturing their prey. They also believed it aided soldiers in battle keeping them safe as they achieved victory. The styles and designs of amethyst jewelry range from delicate pendants and striking multi-strand necklaces chunky bracelets and spectacular rings. The following are a sampling of the many wonderful online jewelry store offering a wide selection of amethyst jewelry. Amethyst, the lovely February birthstone, makes a wonderful gift that is said to strengthen the bond of love and provide protection to the wearer.